I’ve been taking pictures every day for more than a year now. Some days it’s a struggle, other days it’s pretty easy. But one of my favorite things about being a photographer (albeit, amateur) is that it makes me pay attention…and ask lots of questions. Yesterday I was up in our local mountains enjoying all that fall brings…colors and pumpkins and apples…on a warm fall day. 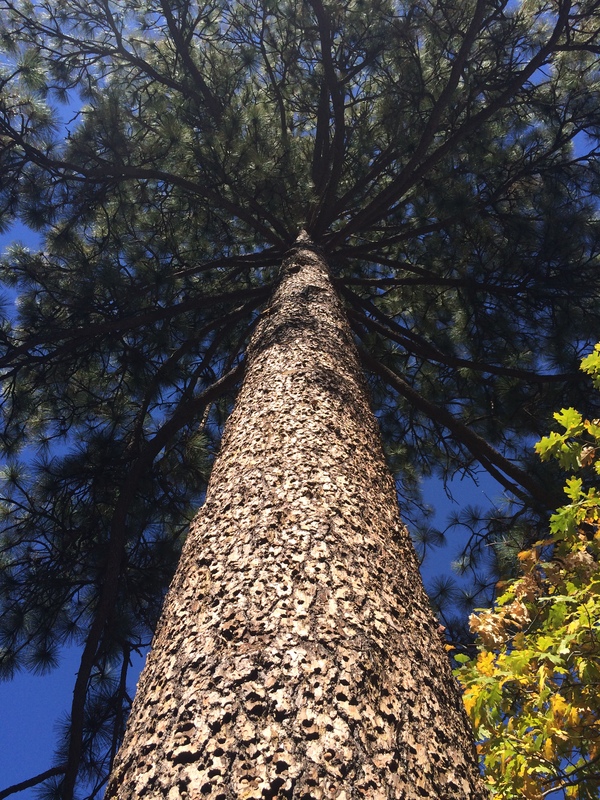 As I was photographing some beautiful leaves turning orange and red and yellow, I noticed this beautiful pine tree. Looking closely, I was fascinated by the texture of the bark on the tree. 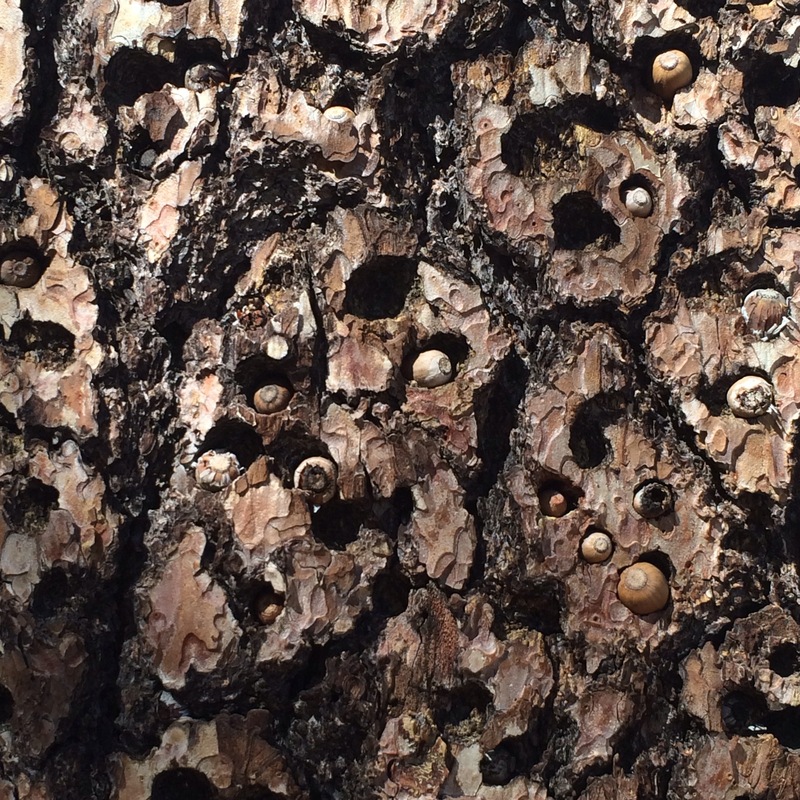 And an even closer look revealed all these tiny holes…with many filled with acorns or other nuts. That observation set off a million questions…how does this happen, what animal does it? Does it hurt the tree? Is it squirrels? And then I noticed this nearby fence post. So it’s not only about trees…it’s about wood. 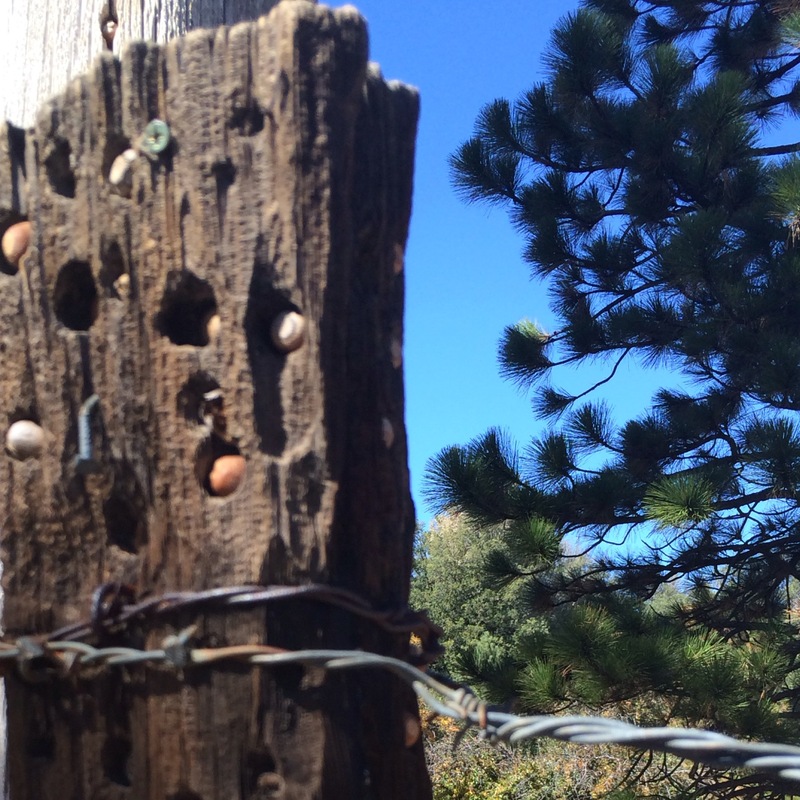 I noticed the nearby utility pole also had holes and nuts. With all these questions running through my head, we continued our adventure and I continued to look for interesting subjects for my photography. A while later, at the edge of a little pumpkin patch I looked up and saw a beautiful blue bird with red markings high up on a utility pole. I thought it might be some kind of jay, but my husband was quick to point out that it was tapping the pole…a woodpecker! 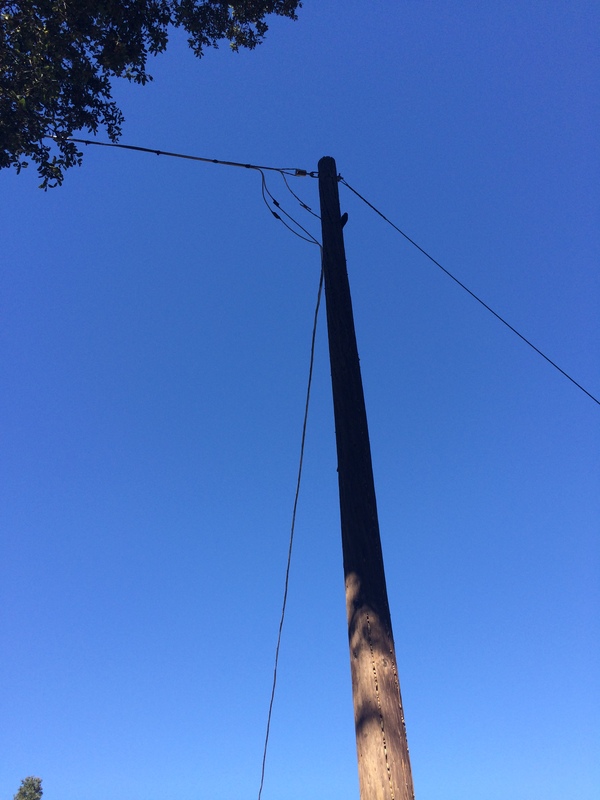 We watched closely, listening to the persistent tapping as it pecked into the top of the pole. I attempted several photographs…but one thing the iphone camera is not good at is long distance photos! Here’s an attempt. The group will guard their territory, and will often have a single tree in which they store their acorns; known as a granary. A single granary may contain tens of thousands of acorns. The acorns themselves are placed individually into a hole drilled into the tree. Acorn Woodpeckers also feed on insects (including aerial flycatching), sap, and fruits. I love that photography always ends up teaching me interesting things about nature and about the world. It makes me pay attention, notice details, and ask questions. It makes me curious…and makes me wonder…a perfect tool for inquiry! And as I write this on the National Day on Writing, I get to share my photography and learning with you! #write2connect in action! How do you write to connect? What do you learn from the activities you love? This entry was posted in Connected Learning, digital tools, nature, photography, thinking, writing and tagged Acorn Woodpecker, inquiry, iphoneography, National Day on Writing, noticing, photography, questions, write2connect on October 20, 2013 by kd0602. Simply wonderful sensual post ! Really nice!